One of the most gorgeous beaches on Kefalonia, Antisamos is a vast golden beach, surrounded by lush greenery. Scenes of the Hollywood movie “Captain Corelli’s Mandolin” were filmed there. 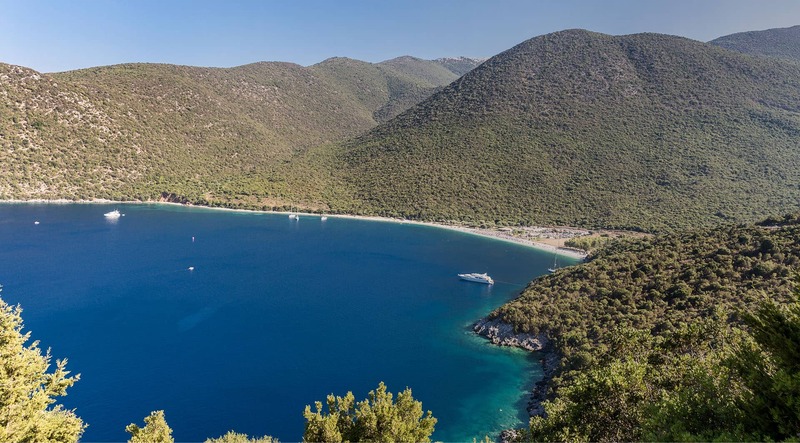 Antisamos is a beautiful and peaceful beach made up of white pebbles, with turquoise water and luscious green hills surrounding it. The sea is so clear and there are hundreds of fish, making for really interesting snorkeling. There are tavernas that offer free sunbeds on the beach, and will bring any drinks or food you order right out to you. Further along the beach there are also watersports. On a quiet day you can only hear the sounds of the waves lapping, birds singing and the tinkle of goat bells in the hills behind. Paradise.